The first groundbreaking server innovation in over a decade, Intel IT’s disaggregated server architecture has the potential to dramatically change how data centers around the world perform server refreshes—leading to significant refresh savings and the opportunity to quickly take advantage of the latest compute technology. This technology is already being used in Intel’s data centers in Santa ...Clara, California, which feature the world’s lowest power usage effectiveness (PUE) rating of 1.06. At the heart of the new design is the ability to independently refresh a server’s CPU and DRAM, leaving the rest of the server enclosure untouched. This means it is no longer necessary to replace perfectly good fans, power supplies, cables, network switches, drives, and chassis. 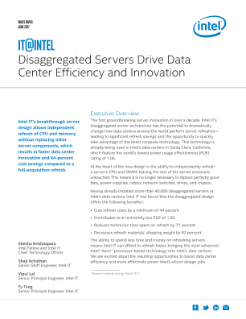 Having already installed more than 40,000 disaggregated servers at Intel’s data centers, Intel IT has found that the disaggregated design offers the following benefits: cuts refresh costs by a minimum of 44 percent; contributes to an extremely low PUE of 1.06; reduces technician time spent on refresh by 77 percent; and decreases refresh materials’ shipping weight by 82 percent. The ability to spend less time and money on refreshing servers means Intel IT can afford to refresh faster, bringing the most advanced Intel® Xeon® processor-based technology into Intel’s data centers. We are excited about the resulting opportunities to boost data center efficiency and more effectively power Intel’s silicon design jobs.